Product prices and availability are accurate as of 2019-04-19 13:34:00 EDT and are subject to change. Any price and availability information displayed on http://www.amazon.com/ at the time of purchase will apply to the purchase of this product. Designed, Manufactured in CA USA. 1. 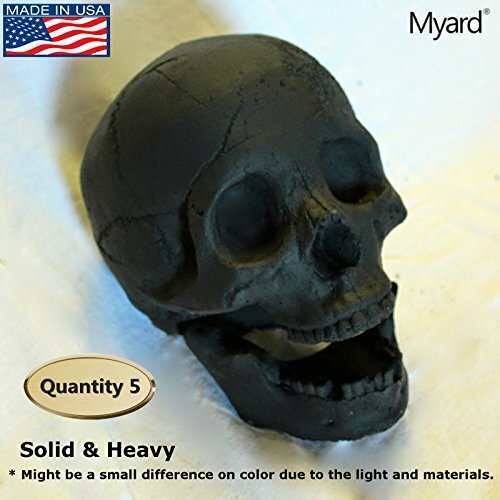 These skulls are made of fire proof materials so they are great for a fire place or fire pit. 2. They are weather resistant and heavy so they will not be blown away in high winds. 3. They are all hand painted using a 5 step process. 4. The skulls are life size, detailed and very realistic. 5. They make a great Halloween decoration. We charge a 25% restocking fee plus the cost of shipping and damages, if items returned.